Jonathan Stroud has done it again … he has written a spell-binding, terrifying novel in a world where ghosts are real and quite threatening. In The Whispering Skull, book two of Lockwood & Company, our intrepid ghost hunters Lucy, Lockwood, and George investigate the hauntings of a Victorian doctor who raided graveyards and built a special ‘bridge’ between the living world and the dead world, with the bones of the dead. 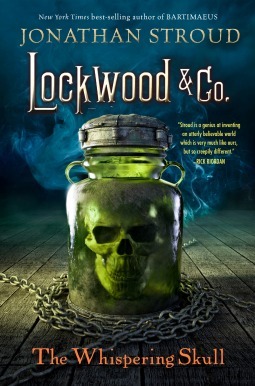 In order to get through this mystery, Lockwood & Co. will need to follow the advice of a ‘Type 3’ skull who talks only to Lucy, and they’ll need to work with agents from the Fittes Agency, which may be more difficult than facing death by ghosts! Jonathan Stroud has really created a marvelous alternative world, and I still feel that he has done for ghosts what Anne Rice and then Charlaine Harris did for vampires, and The Walking Dead and Max Brooks and Mira Grant have done for zombies. He has created a world, with rules, that are completely acceptable and will become the ‘bible’ for future ghost stories. The story alternates between fast-paced, breath-taking action and a flow of story-line information, seeded with an appropriate amount of humor to relieve tension. No one is super-heroic and thus everyone is completely believable as a unique individual. One of the really nice aspects is that in addition to a really good ghost story, we have a story in which the characters grow, as people. They learn from mistakes, show a human side, and are completely ‘real’ to the reader. I would give a slight edge to the first book, perhaps because it completely caught me off-guard and with this second in the series, I knew what I was going in to. But I think that Stroud has done a most remarkable job of world-building, character-creating and story-telling and I will buy every book in this series, to share with friends and family, to hopefully get them hooked as well. I am most eager for book three! Looking for a good book? The Whispering Skull is a great book.